Nothing beats the sweet and velvety smooth, luxury flavors of a Macanudo cigar. 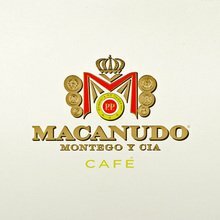 That is until you super-size your order and purchase the Macanudo Gigante. Then your palate will be overwhelmed with a double dose of creamy, smooth delight. If you always order the 32oz. drink, and tell the waiter “Large fries with that please.” Then this is the perfect cigar for you! It is available in boxes of 25. 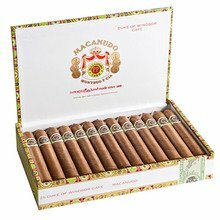 Buy a box, get a Macanudo Inspirado Orange Robusto 5-Pack, valued at $32.45, absolutely FREE! Great cigar. Best bang for your buck. Favorite golf cigar. Great mellow cigar. Wish I would have purchased more. As part of the cafe line this is a silky smith cigar. Love the chew flavor and the smoke is silky smooth as well. Smokes cool and stays mild. The aroma will earn lots of compliments. Some clog up. I am not a Macanudo smoker. I am a full bodied cigar lover. 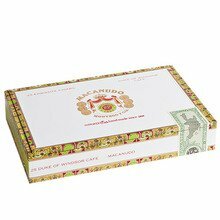 However, true to Macanudo, this cigar is one delicious stick with great flavor and aroma. Not huge on strength, as i usually go to, but big on flavor and quality. Getting the same great flavor and experience from a trusted brand for under brand price. Definitely worth it and will be ordering again. 1 out of 7 found this review helpful. What makes the smaller ring Macs smooth and creamy is the pairing of less filler and binder tobacco. Think of it this way, a Dominican, a Mexican, and a guy from Connecticut enter a bar, they're going to get along. But when a gang of each enter a bar an argument is sure to break out. Well constructed, large ring gauge. Quite mild and nice, mellow flavors. My first review, was titled "Bigger Isn't Better". 4 cigars later I've learned that drawing it really slow and steady makes a significant difference in experiencing the creamy enjoyable flavors Mac is known for. Drawing this slow is a little uncomfortable for me, but the reward is worth it.